Ripple indicates both the name of the platform and its digital currency (XRP). It is a distributed and open source payment network, and it is in the beta format. Ripple aims to break free the concept of “walled gardens” in various financial networks like banks, Paypal, banks and other institutions which restrict access with charges for exchanging currencies and processing delays. Ripple is currently getting traded at USD 0.326195 (UTC time 04:36). With a market cap of USD 13,632,394,507 and a circulating supply of 41,792,108,527 XRP, it is the third largest cryptocurrency in the world. The above chart shows that at present, Ripple is getting traded at 0.326325 USD or 0.00006482 BTC (UTC time 04:44). Its present market cap is worth of 13,637,820,592 USD with 1,462,464,776 USD as its 24h volume. The same chart shows that approx. 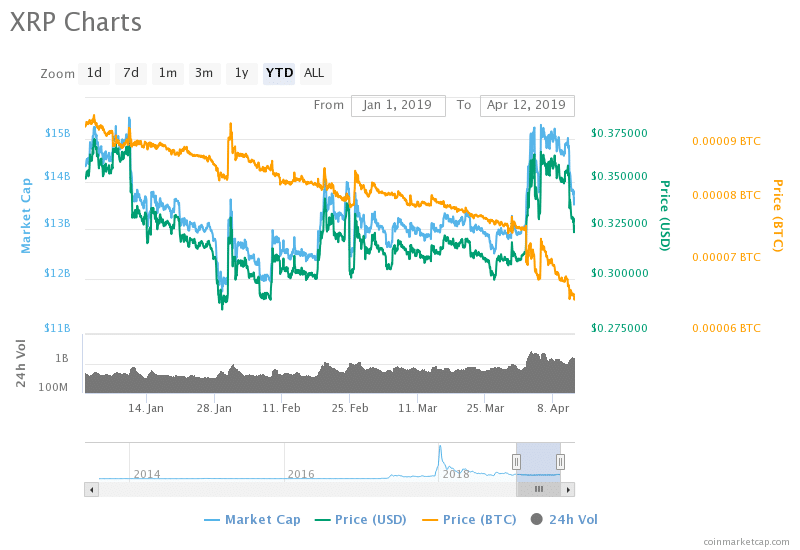 One month earlier, Ripple had a trading value of 0.320159 USD. So, within this period, the value of XRP has been increased by 1.92% with 0.312901 USD as a good support resistance. Every crypto enthusiast has heard the news that Ripple is all set to enter the gaming industry. Its strong network has already reached over 150 clients across the world. It is all set to revolutionize the payment system and want to be dominant in cross border payments. With the blockchain technology gaining attention from financial institutions, Ripple has high chances to navigate through its development and be leading crypto in the upcoming years. Majority crypto analysts have assumed that the value of Ripple will soon be on the bullish trend as its price has been in the side of stability even in the high volatile crypto market. Accordingly, we think that Ripple can be around $1.25 by the end of 2019 and if its performs very high and reaches to more number of financial institutions, then, its value can even cross $2 mark at the end of 2019. Though the market volatility is of greater importance, so far price hikes are concerned. Ripple is potential crypto, and it is aimed to cause a massive revolution in financial networks. Its price will also be on the higher side in the upcoming days so; it is worth investing in this crypto for higher returns.